CHAT's project staff have been extensively trained in the requirements of accurate data collection and reporting, and they regularly use the Ministry of Health (MOH) registers and reporting forms. Additionally, the staff are familiar with reporting requirements of several donors, including the US government's PEPFAR program (via CHF), USAID (via FHI & AMREF), and The Global Fund programs (via CARE & AMREF). The sets of indicators used by these programs are sufficient and will be used to monitor the progress of the project in reaching set targets each month. Projects collect indicators which are reported to the MOH on a monthly basis, and to stakeholders upon request. CHAT's financial records are carefully maintained, and external audits are conducted annually. Financial reports are compiled for stakeholders as required. The Trust managers use CHAT's financial and progress reports to assess the accomplishments of the health services and to identify and address any shortfalls. CHAT has a Monitoring & Evaluation Plan in place, as well as a Strategic Plan and a Sustainability Plan. Governance, Human Resources, and Finance & Procurement policies are also in place. CHAT partners with & capacity build Community Own Resource Persons (CORP) to provide on-going support to the local populations when the clinic is not present. 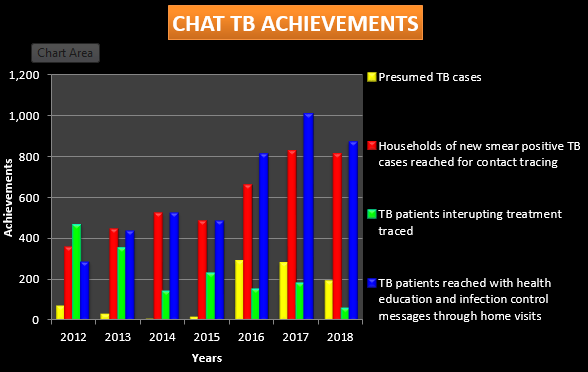 CHAT not only provides treatment & referrals for presumed TB but also provides health education to minimize spreading and improve compliance with medication. Family Planning clients provided with their contraception method of choice. CHAT provides treatment for many ailments, such as upper respiratory track infections (URTIs), malaria, diarrhoea and skin infections. Kenya's HIV prevalence rate is 5.4%. CHAT integrates a number of relevant HIV/AIDS service components into all of our interventions, which include counselling and testing as well as education on transmission prevention and referrals for anti-retroviral treatment (ARVs). ﻿﻿CHAT's achievements are directly related to the funding that is received in any given period. 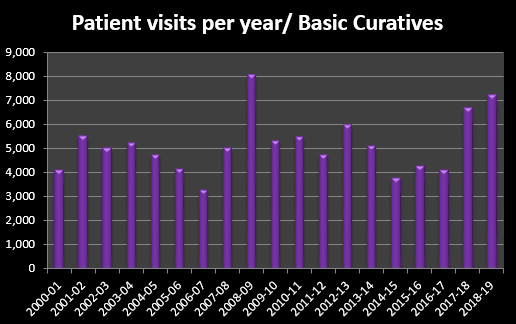 Variations in the above graphs are attributable to how much funding was available for a particular purpose during that year. For example, a year with a high level of TB funding, will see more people treated for TB. It's that simple. Our donors include private individuals (both from Kenya and overseas) as well as well-established charities, NGOs and the Kenyan government. To make a donation, please go to our Donations page. CHAT defines expenses that are directly attributable to the execution of each project as direct costs (e.g. wages of the nurse for a camel clinic) and other overhead expenses (administration) that are necessary to keep the organization running as indirect costs (e.g. office rent and wages for the Finance Officers). Our financial statements and financial policies document are available upon request.